What a fabulous way to welcome warmer weather! If you weren't able to join us for the First Friday Art Walk on April 3rd, there is still time to see new works from Grant Penny, Suzy Schultz and Karen Titus Smith. Our exhibition "New Artists and Old Friends" runs through May 31st. However, you may have missed a chance to speak with our guest artist and Asheville's own Grant Penny about his exceptional collage work. Upon closely examining his work, it is natural to look past the simplicity of his subjects, as the complexity and discipline in his design process shines through upon careful inspection. The simple joys of existence are admittedly inspiring to Penny, however the beauty within the process is what truly makes his work merit a second look. Leonid Siveriver and Amy Medford will be at the gallery for our next First Friday Art Walk with a fascinating digital presentation and discussion of the processes involved in marble carving and bronze casting. Come meet these incredibly talented sculptors and see what inspires them in their moment of creation! They're passion and creativity will lead you into their sculpting world and introduce you to their own artistic language and processes. This rare insight into some of the most astounding methodologies involved in two of mankind's oldest art forms is definitely not to be missed! Featured artists for “Asheville in the Third Dimension” are sculptors and Leonid Siveriver and monoprint photographer Robert Asman, artists who have lived and worked in locales around the world, from Philadelphia and New Jersey to Israel and Italy, and now they are firmly planted on Asheville turf. “The Third Dimension” refers to objects in space in which depth is added to height and width. While sculptures are clearly three dimensional, the monoprints of Asman create a dizzying feeling of depth through the juxtaposition of people and the world around them, as well as the layering of special effects done in the darkroom. There is also a philosophic meaning to “third dimension” in which the reality or significance is intensified by the added dimensions. The works of Asman, Medford and Siveriver are all contemplative, and the deeper one looks, the more there is to be seen and felt. Our calendar is quickly filling up as our 2015 season promises to be a big success! We have already scheduled dates in June, July and Augest for The Ramble at Biltmore Forest and The Cliffs at Walnut Cove! 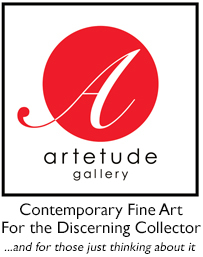 Sign up to receive news and updates from Artetude Gallery sent directly to your inbox! Form has been an important element in Smith's process as a painter. Her masterly crafted two-dimensional works deconstruct popular images into disassociating yet thoughtful and unique pattens and colors. Her inspiration draws from her daily life, such as the beauty of her natural surroundings or a significant event. Her work stems from anything that impacts her thoughts, inspires a form, a shape, or an idea, which she then explores in a visual format. She plays imagery against media, mixing objective and subjective “pushes”, enjoying the interaction between the contrasting imagery and forms. Big thanks to a United Way of Asheville and Buncombe County for helping us put on a super fun and educational event! Students from Enka Middle School, North Buncombe Middle School, and Valley Springs Middle School were welcomed for a personal tour of our gallery. Gallery Director Amy Medford and Gallery Assistant Jonathan Carlson were on hand to answer questions regarding our art and our artists and explore the importance of art and education in the lives of our young scholars. Gallery Director and artist Amy Medford answers questions from middle schoolers during Students @ Work - Art & Culture Day at Artetude Gallery. Do you need an inspiring, centrally located and sophisticated venue for your special event? Whatever the occasion, we would love to host it for you. Please contact us at (828) 252-1466 or email director@artetudegallery.com for more information on pricing and other details.